Thank you for visiting us. 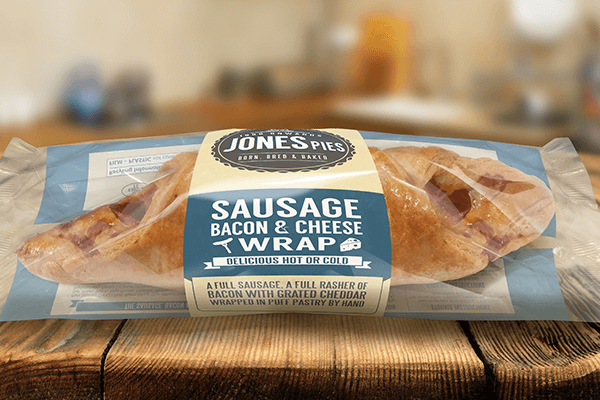 We have been lovingly baking pork pies, pasties, rolls, wraps and slices in Yorkshire for nearly thirty years. 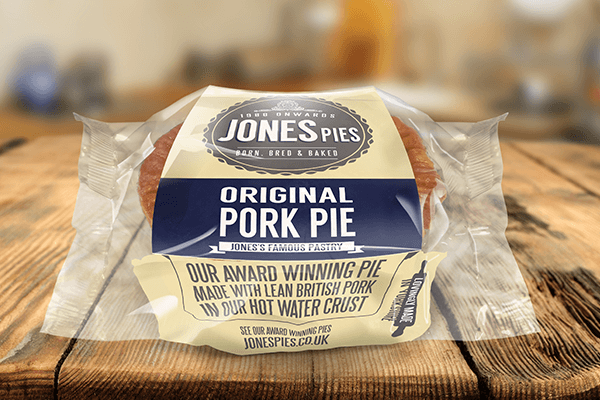 If you would like to find your nearest stockist please call us on 01484 548137 or email us at accounts&commat;jonespies.co.uk. The original and best. 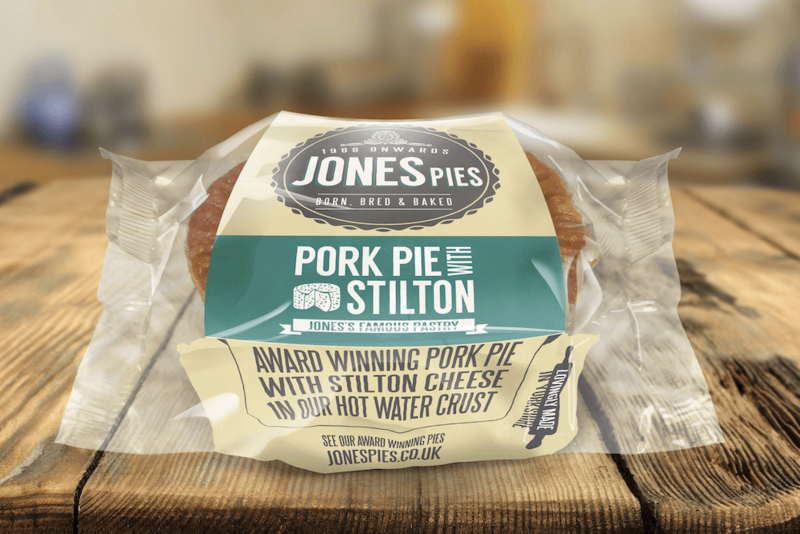 Our award winning pie made with lean British pork in our hot water crust pastry. Available in small (160g), medium (1lb), large (1.5lb) and extra large (3.5lb). 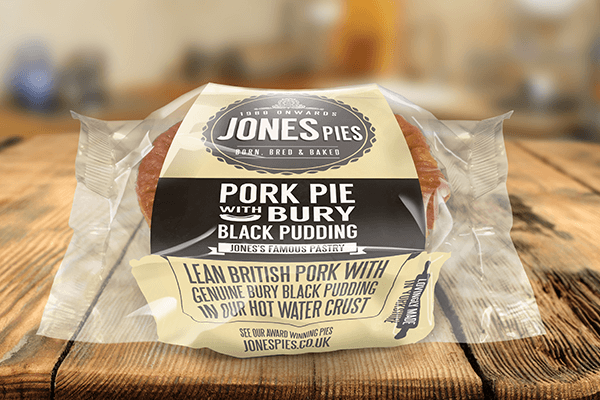 Lean British pork with genuine Bury black pudding in our hot water crust pastry. Available in small (160g) and medium (1lb). 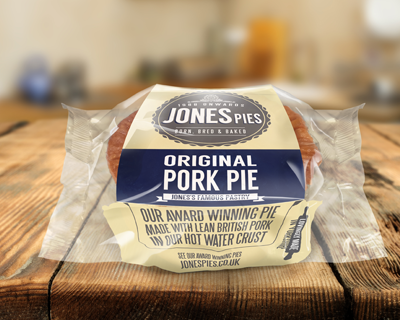 Lean British pork with a tangy, caramelized red onion chutney from Shaws of Huddersfield in our hot water crust pastry. Available in small (160g) only. Cheddar cheese and a tangy, fruity pickle in our hot water crust pastry. Our award winning pork pie with Bramley apple and our classic sage and onion stuffing in our hot water crust pastry. Available in small (160g), medium (1lb) and extra large (3.5lb). Award winning pork pie with Shephards Purse Yorkshire Blue and Stilton cheeses in our hot water crust pastry. 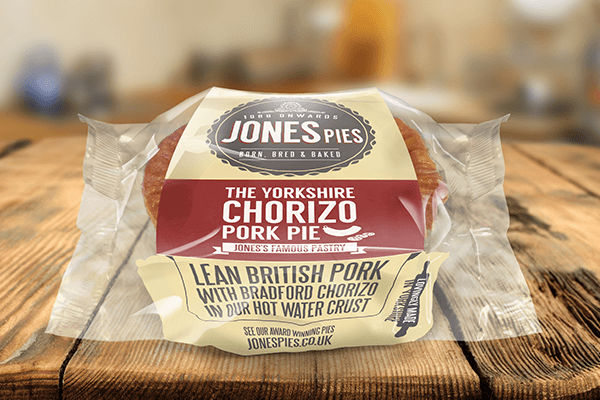 Lean British Pork with chorizo made in Bradford in our hot water crust pastry. 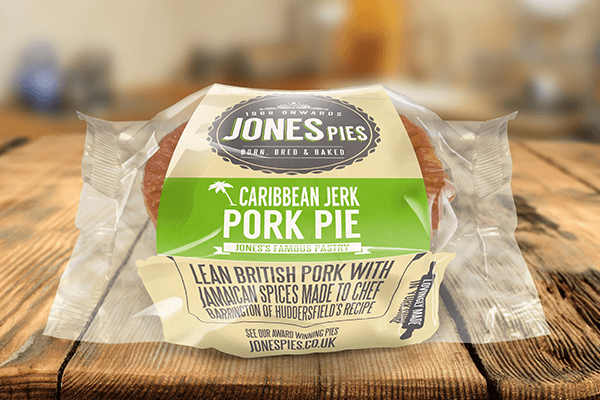 Lean British Pork with Jamaican spices blended to Chef Barrington of Huddersfield’s recipe in our hot water crust pastry. 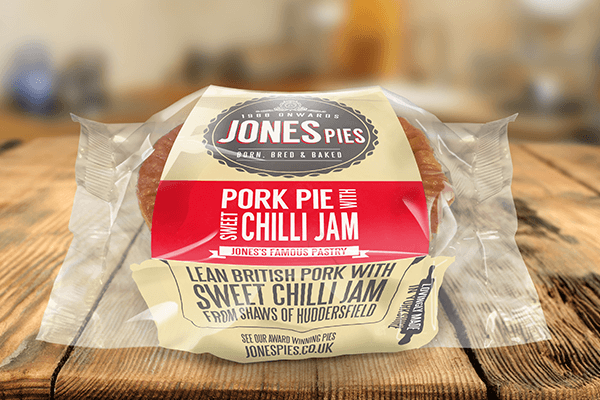 Lean British pork with sweet chilli jam, from Shaws of Huddersfield, in our hot water crust pastry. Prime British beef slow cooked with ale from the Osset Brewery in our hot water crust pastry. Available in regular size, 7" plate, 9" plate and a 10-14 portion slab. British beef slowly cooked with Hendersons Relish. British chicken breast and gammon ham in our hot water crust pastry. Available in regular size, 7" plate and 9" plate. 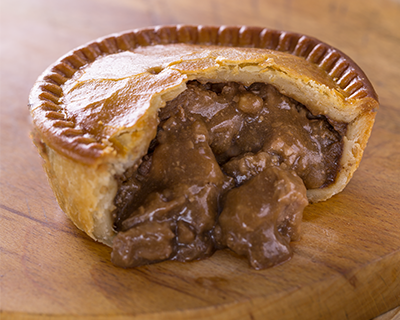 British beef, slow cooked until tender, in our hot water crust pastry. British Beef and potatoes in Jones’s original gravy in our hot water crust pastry. Tender chicken pieces with spices blended in Bradford to Chef Barrington of Hudderfield’s recipe. 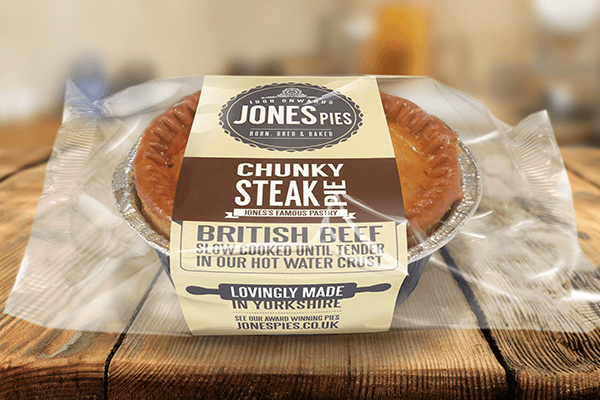 Lean British beef and onion with Jones’s original gravy in our hot water crust pastry. 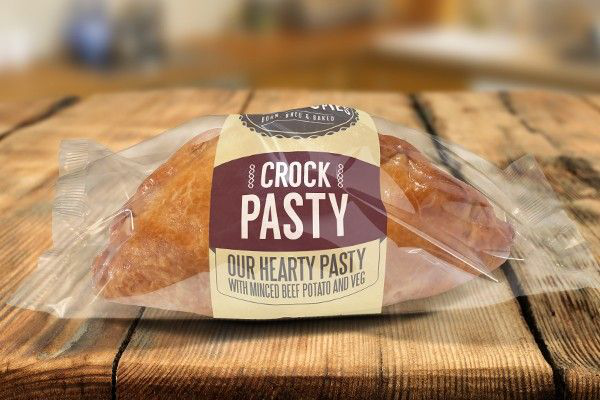 Our hearty pasty with lean British minced beef and veg in our hot water crust pastry. A timeless flavour combination, delicious hot or cold. Lean British pork, rolled folded then cut. All done by hand. A classic, delicious hot or cold. A family favourite, delicious hot or cold. Jones Pies was started in the back of a Yorkshire Butchers shop in 1988 and since then has gone on to be renowned for it’s fantastic range of pork pies, pies, sausage rolls and pasties. 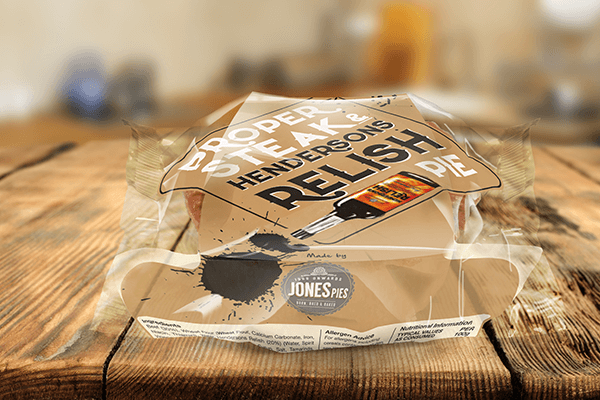 The business grew in the best way possible – people ate our pies, loved them and told someone else – who in turn tasted them, loved them and told someone else! 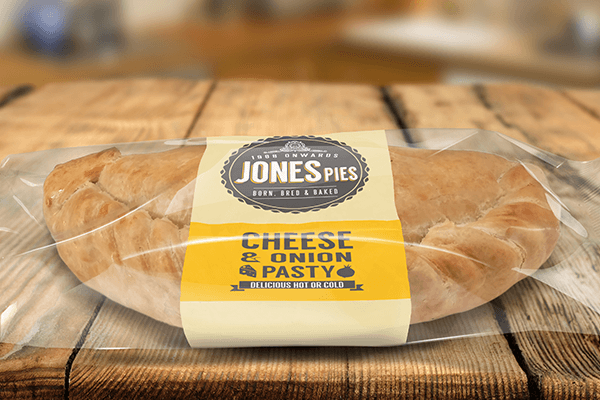 Other shops wanted to sell our pies and this combined with winning award after award has led to us making over 45,000 pies every week from our very own accredited bakery. Our team of skilled Bakers and Pie Makers work six days a week to make sure our memorable taste experience is baked and delivered fresh daily. At Jones Pies we stay true to the good old fashioned ways of making a great Pie. 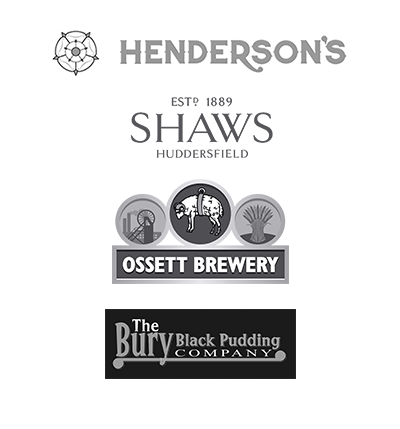 Every pie is hand crafted using the best meat and the best of local ingredients – from Ossett Ale in our Steak and Ale Pies to Sheperds Purse Yorkshire Blue in our Pork Pie with Cheese! If you are interested in stocking our pies please call us on 01484 548137 or email us on info&commat;jonespies.co.uk. We are happy to help. For next day delivery order before 4pm. Minimum order value is £20. Pies can be ordered in singles so you can order the selection that meets your needs. Order as many or as few as you need. 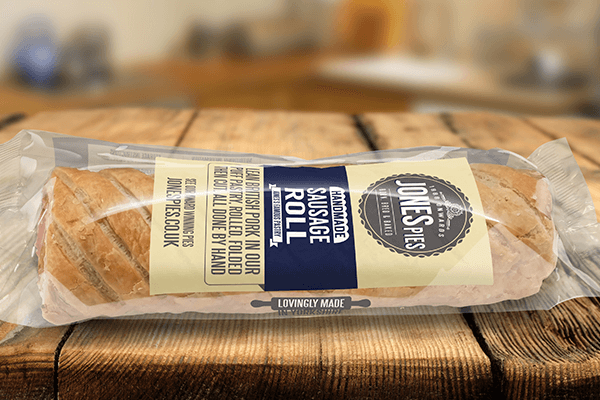 Our range is available chilled pre-packed, chilled baked loose or frozen unbaked. 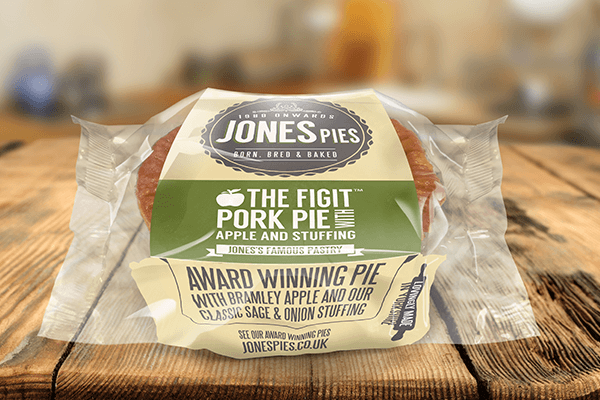 Chilled pies and pastry products have an 8 day shelf life. All our vans are dual temperature so customers can have chilled and frozen products in the same delivery. © 2016 copyright AJ Pies and Pastries Ltd and Jones Pies. All rights reserved.